I don’t hide the fact that I like my little girl’s fashion to include bold rather than pastel colours. I also prefer structured clothing with clean lines rather than pieces that are frilly. So naturally the brand new label LOPPA caught my eye. The LOPPA collection (which means ‘little flea’ in Swedish) is the work of Belgian designer Feli Laisné. Laisné has worked in children’s fashion in France, Germany and Holland and with LOPPA, she gives traditional styles a distinctly modern edge. The silhouettes hark from other eras – for instance, the 1960s-influenced Claudine collar and detailed yoke on the superb Sarah shirt, the divine Doris A-line dress, and the sailor-inspired dresses, shorts and playsuits that invoke the turn of the last century. It is difficult to choose a standout as all the pieces combine so beautifully, however the short-sleeved Paola jumper with the contrast band and yoke plus covered wool buttons is fabulous, as is the fun Camille Combishorts – you can only get away with playsuits for a short time in your life, so do it in LOPPA style! The details are exceptional and the fabrics exquisite, including cotton toile, merino and jersey wool. If I had unlimited funds, the whole LOPPA collection would be sitting in my daughter’s wardrobe. It will be exciting to see Laisné’s summer ’10 collection. 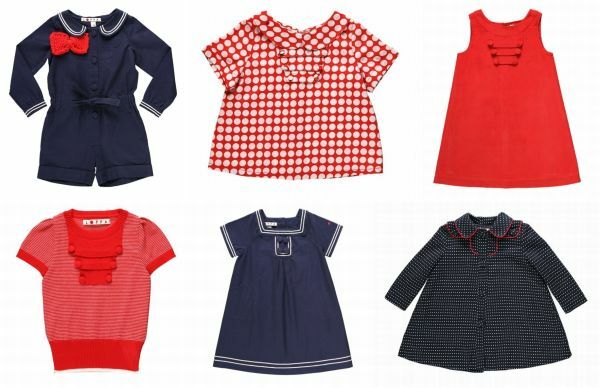 LOPPA is available from The Little Fashion Gallery, which ships internationally.